Chemotherapy has many side effects, including Chemotherapy-Induced Peripheral Neuropathy (CIPN) which is caused by damage or irritation of nerves carrying feeling sensations from the limbs, hands and feet to the central nervous system. It is either described as a numb or frozen feeling, as well as a cramped, tingling, sensitivity to temperature feeling in either direction. Numbness in the feet may result in difficulty balancing, because affected individuals can’t properly feel the ground. Even though this condition begins as a side-effect to treatment, it can persist even afterward the treatment is finished, making everyday tasks more difficult to get through. There are certain home remedies like padded foot wear, warm baths and a variety of occupational therapy techniques, but we encourage you to consult with your primary care physician and your podiatrist first, because some of the symptoms may be a cause of other conditions. Please see below for further information and don’t hesitate to contact Dr. Smith and Dr. Buckrop if you have any further questions. This entry was posted in Foot Care and tagged Cancer, Neuropathy on February 20, 2019 by Dr. Kevin Smith, DPM. One of the coolest parts about working as a podiatrist is that no two days are exactly alike. There’s just enough similarity to keep things manageable but the variety in patients, diagnoses, and treatments means every day has a new challenge that I can’t wait to tackle. Typically, I tend to see a lot of diabetic foot care, heel pain and fungal nails. However, most days I get a little bit of everything from trimming nails and callouses to treating bone spurs. Most often I see people for fungal nails which is a very common condition in general. Heel pain is common too because it can be a condition on its own or an indicator of something else that needs to be addressed. Every once in a while, I get a case that really sticks out above the rest. Like I mentioned before I do a lot of diabetic foot care and with that comes treating the neuropathy and numbness some people get in their feet. There was a patient I was treating for neuropathy who came in complaining about a strange pressure sensation in his foot. During the examination, I noticed a strange kind of figure-eight shape pressed into the bottom of his foot. Obviously, this is very unusual, so I took a look inside his shoe and you wouldn’t believe what I found… a pair of folded up sunglasses! When I pulled them out and showed him, he went, “There they are!” Apparently, he had dropped them at some point and had been walking around on them without realizing it. There’s never a dull moment around our office! 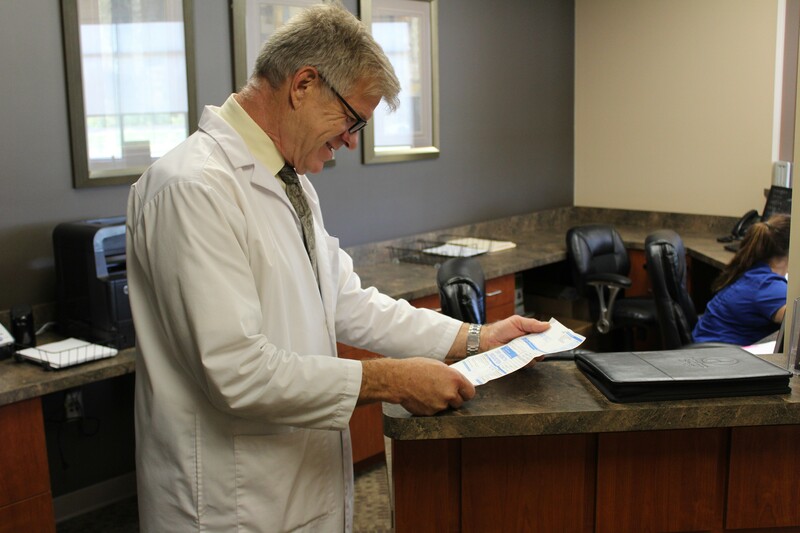 Facebook Post: Take a peak into the daily happenings at Dr. Smith and Buckrops’ office with this month’s blog! You won’t believe some of the stories he has! This entry was posted in About Us and tagged Diabetes, Neuropathy on January 23, 2019 by Dr. Kevin Smith, DPM.